Gary Johnson, the former Republican governor of New Mexico turned Libertarian Party nominee for president, has no qualms about possibly costing either of the major parties the White House this fall. “I will lose no sleep if that is the label given to me,” Johnson assured those gathered at the National Press Club on Thursday when asked about potentially inheriting the “spoiler” mantle from previous third-party challengers Ross Perot and Ralph Nader. If anything, Johnson sees the polarizing 2016 campaign as the perfect opportunity to disrupt the status quo. Johnson’s running mate, former Massachusetts Gov. 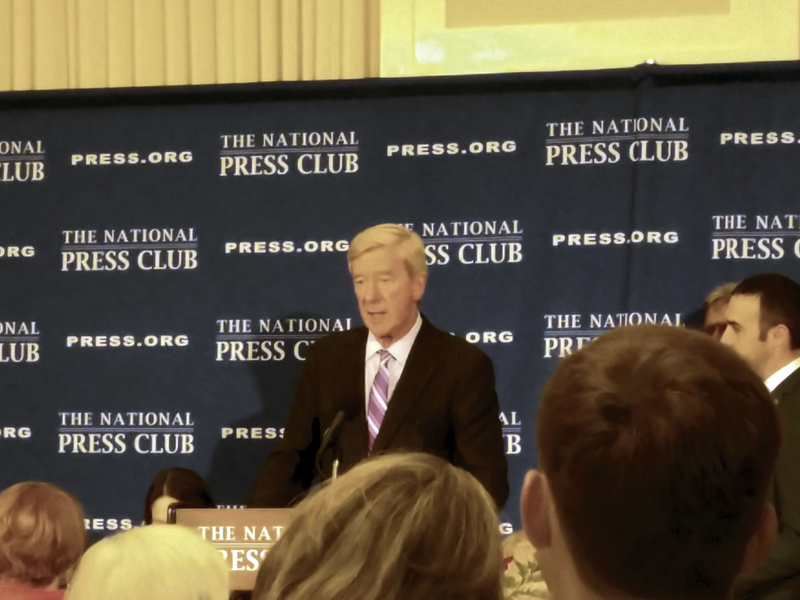 William Weld, also addressed the dozens of supporters and press gathered to hear how the pair’s bid for the Oval Office was progressing. Although just a few miles from the Capitol, the mood at the Johnson-Weld luncheon — optimistic as it was — felt miles away from the rancor and cynicism on full display in a House Oversight and Government Reform Committee hearing focused on the administrative shortcomings of likely Democratic candidate Hillary Clinton. Rather than shying away from their respective standard-bearers, as some Republicans did Thursday by coyly meeting with or outright avoiding the presumptive GOP nominee Donald Trump, those on hand at the press club luncheon were excited about getting up close and personal with the guest speakers. “Do you think I could take a picture with them?” one suit-clad admirer asked club staff, his smartphone already in hand. Johnson, who collected over a million votes during his 2012 presidential run, firmly believes the Libertarian Party is gaining traction. Johnson attempted to brush aside any notions that he or Weld would be satisfied with merely gaining entry into the upcoming presidential debates — a milestone predicated upon their earning 15 percent support in national polls. “We would not be doing this is there were not the opportunity to actually win,” Johnson said of his career ambitions. Rather than ambush individuals — “No insults. No threats. No bluffs,” is how Johnson characterized their presidential platform — the duo indicted the current political system in general. Weld, also a onetime Republican like Johnson, accused establishment politicians of being interested in the same thing: maintaining their duopoly. Johnson slammed those on both sides of the aisle for betraying the public trust. “They’re all about spending and nothing about results,” he argued. If elected, Johnson promised to take the fight directly to Congress, mapping out plans to hold the GOP’s feet to the fire on federal budgeting and expanded government while challenging Democrats on civil liberties and entitlements. “This is a huge opportunity. Don’t you see it?” Johnson posed to the crowd. Contact Rojas at [email protected] and follow him on Twitter at @WARojas. HELP THE USMJPARTY PURCHASE A NEW BANNER! The one we had was stolen! Kentucky USMjParty TWITTER! Come follow Kentucky USMjParty on TWITTER! USMjParty TWITTER Come follow the @USMjParty on TWITTER! USMjParty.Com Main website of the USMjParty. Join the website, Get a newsletter or buy a membership here! THE KINGPIN THORNE PETERS! "ILLEGAL v. UNLAWFUL" . HELP THE USMJPARTY PURCHASE A NEW BANNER! USMjParty – LIKE OUR FACEBOOK PAGE here! S 510 Will you be a criminal if you plant a garden ? The U.S. MARIJUANA PARTY STANDS WITH STANDING ROCK!